Stingray was well into its first run on British Television by the time TV Century 21 appeared on the newsstands, and for this reason it was the star strip. TV Century 21 was announced in the trade press as the series premiered on British television, and screenings of an episode were the main feature at launch parties for the comic in December 1964. 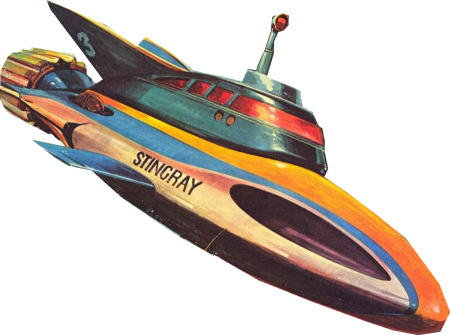 Stingray was the second futuristic Anderson series to be made, and with Thunderbirds already well into production, the seeds were sown to bind these futures into a cohesive whole. Unlike other comics, TV Century 21 resembled a glossy newspaper sporting full colour photos to report this new future on a week by week basis, retaining this format proper for its first three years. Stingray Lost! proclaimed the headline of the first issue, over a full colour photo of the eponymous submarine being attacked by a Titan Terror Fish. It is difficult now, for anyone born after the establishment of colour television, to realise what seeing these marvellous photos would have meant. Until the late 1960s, Stingray, and the later Thunderbirds, Captain Scarlet and Joe 90, could only be seen in black and white, and it would be well into the 1970s that actually having a colour television would become the norm. While full colour strips had come to the fore with the Eagle in the 1950s, the addition of frames from the TV series to the artwork added a new dimension. And like Eagle, the artwork in TV Century 21 takes a more serious stance instead of trying to mimic the exact appearance of the puppets. Artists went for a realistic look, yet still tried to maintain a visual similarity in facial features if nothing else. While it had been tried once before on Supercar before reverting back, few would argue that the decision to have realism over comic caricatures was the wrong one. Thanks, that is nice, i like Stingray alot.